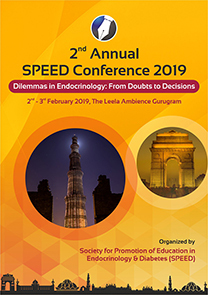 Society for Promotion of Education in Endocrinilogy & Diabetes (SPEED) was born out of an yearning to create an academic platform encompassing super-specialists, general physicians and community at large. Laying its roots in 2014, SPEED is the collaboratibe effort of a group of young endocrinologists. The objective of the society is to promote evidence based and updated endocrinology practice through educational interactions among the different echelons of our society.